Ultrasound type is received as safe to use among users, alleviating their concern about radiation emission as in the case of X-ray. Relieve burden on patients as the measurement time is only 15 seconds or less. Compact size, easy to move and can be installed anywhere. Diagnose osteoporosis by comparing bone mineral density acquired through computer-calculation of ultrasound measurement data,to the mean of sample group and standard deviation. Minimal difference in repeatability due to temperature change since BQI (Bone Quality Index)is calculated,using a combination of SOS and BUA. Embedded thermal printer allows easy, quick, cost-saving printout of the result, guaranteeing optimal performance during medical examination on the move. Cheaper to maintain due to the probe made of semi-permanent and highly elastic and safe material, without requiring balloon which uses water or oil. When the foot is put in the equipment, the probe is automatically positioned on both sides of calcaneus by fine-tuned pressuring sensor. USB port on the back of the equipment makes patient data management easier. Measurement Time : 15 sec. 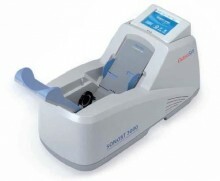 Click the button below to add the Osteosys Sonost-3000 Bone Densitometer to your wish list.